Calestous Juma, of Harvard University’s John F Kennedy School of Government, talks with clarity and humour about the hopeful future that he sees for Africa as the use of bioscience grows in the African agricultural sector. He predicts that once started, African development will be faster than Chinese development since Africa has access to decades more globally generated knowledge. This lively 45-minute keynote presentation was given by Juma at the International Livestock Research Institute in Nairobi in March 2011. The occasion was the official launch of a regional Bio-Innovate Program, during which Juma introduced his newly published book, The New Harvest–Agricultural Innovation in Africa (Oxford University Press 2011). See also a 2-minute interview of Calestous Juma conducted at the same ILRI event. Calestous Juma, director of the Science, Technology and Globalization Project at the John F Kennedy School of Government at Harvard University, was film-interviewed at the official launch of a Bio-Innovate Program at the International Livestock Research Institute (ILRI), in Nairobi on 16 March 2011. In the interview, Juma, an eminent Kenyan bioscientist, says that biosciences offer many regions in Africa an opportunity to produce surplus food for the first time. ‘Without biosciences research within Africa, agriculture will face a difficult future. The Bio-Innovate Program is important because it will stimulate new industries that are linked to the life sciences. Farmers will not benefit from producing more food unless they can get it to markets to process and sell. Watch the short (2-minute) filmed interview of Calestous Juma by ILRI: Biosciences will be the key that allows Africa to feed itself, March 2011. 'The New Harvest' in Africa: Untapped potential or looming catastrophe? 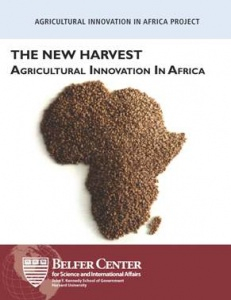 The New Harvest: Agricultural Innovation in Africa, by Calestous Juma (photo credit: Harvard's Belfer Center). Madeleine Bunting discusses in the Guardian's Poverty Matters Blog today (3 December 2010) a new report by Harvard academic Calestous Juma, The New Harvest: Agricultural Innovation in Africa. SciDev.Net reports today that experts in African food security gave Juma's report a cautious welcome. 'Bruce Campbell, head of the Consultative Group on International Agricultural Research's (CGIAR) programme on climate change, agriculture and food security, said: "While Juma's book is optimistic, one needs to recognise that there are tremendous challenges that are not very simple to solve". . . .
'And Philip Thornton, a senior scientist at International Livestock Research Institute in Kenya, who led a recent study that concluded global warming could spell a catastrophe for Africa's agriculture, warned that "there are many [climate change] factors that are not under Africa's control". Lindiwe Majele Sibanda, CEO of the Food, Agriculture and Natural Resources Policy Analysis Network, based in South Africa, and a member of ILRI's board of trustees, is a contributing author and member of the report's international advisory panel. Read the whole articles at the Guardian's Poverty Matters Blog: How can Africa grow more food?, 3 December 2010 and at SciDev,Net: Africa could feed itself, says development expert, 2 December 2010. Research is allowing African farmers to overcome old problems and exploit new opportunities. The debate is raging on as to how best Africa can set itself on the road to growth and renewal, and whether blanket debt relief for all African countries is the best solution. African leaders recognise that agriculture is Africa’s engine for growth, and that there is a need to take a long-term view and build science and technology capacity within Africa to help Africans solve Africa’s problems. Top African scientist and Harvard Professor, Calestous Juma, speaking to BBC yesterday (7 July) said: “If all the aid from Live 8 was spent on agricultural colleges rather than relief, Ethiopia would not be in difficulties today.” “Helping to build scientific expertise will do for Africa what the invention of the electric guitar did for Bob Geldof.” Dr Carlos Seré, Director General of the International Livestock Research Institute (ILRI), said “I would urge that there is greater emphasis on building science and technology capacity in Africa. Agricultural research in Africa is producing robust returns of 35% and changing the lives of millions of Africans. Money wisely invested in science – building expertise in Africa for African problems – will reap long-term benefits that will help millions of poor people in Africa secure better health, education, and livelihoods.” See below ILRI’s feature “Canadian and British Research Investments Pay Off for Africa” published in The Herald (Scotland), Friday 14 July 2005 (.p15).